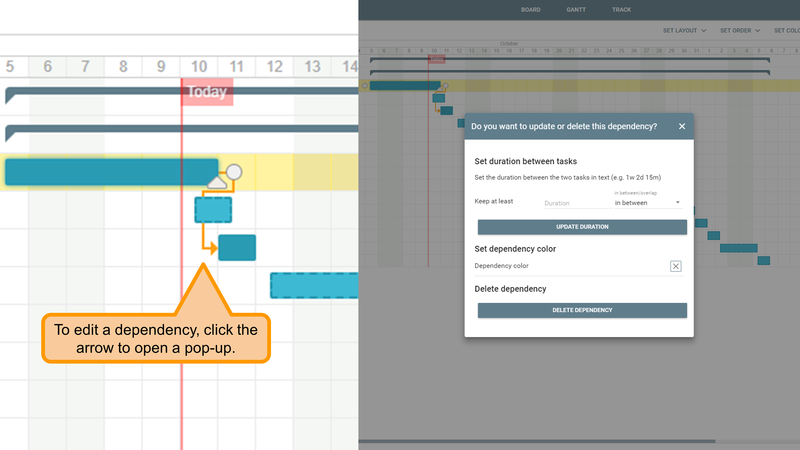 Edit tasks in the Gantt view mode to keep your board up to date. The Gantt view mode is useful to visualize the cards' start and end dates along the timeline of a board. It's also a great way to see if the project in on track or delayed. Furthermore, you may edit the cards' attributes without leaving the Gantt view mode, which makes it even more practical. One of the easiest ways to update a task's dates, progress and dependencies is by simply clicking and dragging the bars. Another way of making changes is to click the name of a card or the correspondent bar. By clicking once, a panel will be shown on the right hand side. By double-clicking, a pop-up will appear. You may also create new cards with the plus sign next to the list of tasks. To delete or set overlaps between tasks, simply click a dependency.